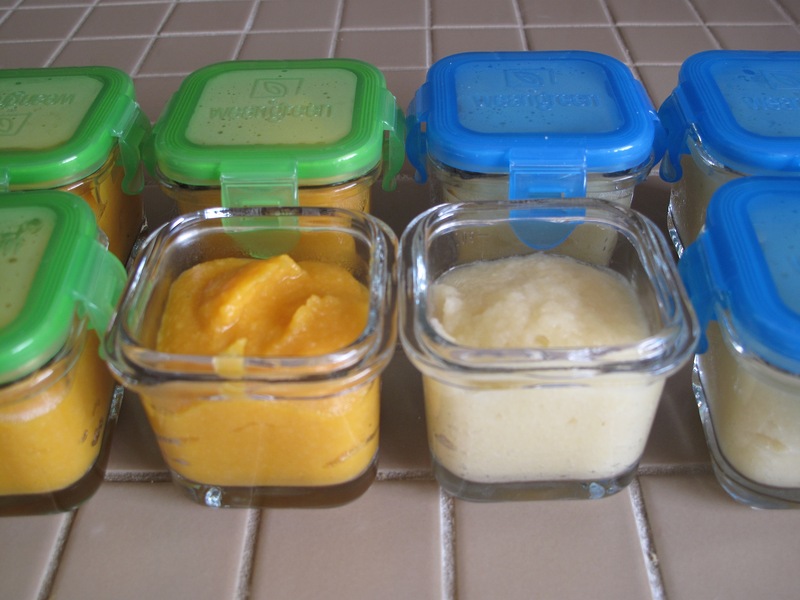 The topic of baby’s first foods can be super varied on opinion of when to start, what to feed them, and what your baby will actually try so this is just what I have done thus far and plan to do for the future. With Ryker we had planned on starting at 6 months, but ended up starting around 5 months because, by that time he already had 4 teeth and was grabbing at everything we were eating or drinking. I feel that your baby will tell you when he or she is ready to start eating food. Initially I started Ryker out on rice cereal, about 4-8 tbsp to start. He did like it (somewhat), but it ended up constipating him quite a bit so that only lasted about a week before I switched to making my own foods. Since the rice cereal was backing him up, I decided to incorporate foods that were full of fiber and more gentle on his stomach such as, pears, peaches, peas, apricots, yams etc. I was feeding him about 4 oz. once a day. He is now up to 2 meals a day of pureed foods (4oz. each), I also give him a few sips of water and a teething biscuit in the middle of the day. He has been finishing all of the food I have been making for him, so that is great, but I am keeping an eye on signs that he is full so that I am not force feeding him. I want him to be able to develop his own sense of appetite. I have been creating more textures and flavours in his foods by adding brown rice, cous cous and herbs and spices. He has had a fairly sensitive stomach so far, so I am introducing everything in stages so I can easily monitor what is working for him and what is not. Also I will be starting to add in some proteins such as Chicken and Turkey this week (hopefully he likes it). The 2 proteins I will be avoiding are fish due to the mercury, and soy due to phytoestrogens….don’t really want to mess with either, but that is of course a personal preference. I will be starting him on some finger foods this week, so I’ll have to let you know how it goes. We did try Mum Mums already, but he really didn’t like that at all. I think I am going to bake some pears with a little cinnamon and dice them up for him, as I know he loves his pears. If anyone has any suggestions and what worked for them, I am open to it. Pictured below is his breakfast which is a mix of white peach, apples, cantaloupe and cinnamon as well as his dinner which is yams, whole wheat cous cous and dill. And they are all in my Wean Green Cubes of course :). I make about 4 days worth of food at a time, so I freeze and thaw as I need to. This entry was posted in Baby, Motherhood and tagged baby, baby food, parenting by Karina. Bookmark the permalink.